A PRODUCTION house in Mumbai is on the verge of announcing a multi-million pound reality TV show called ‘Search for a global Bollywood Superstar’, www.asianculturevulture.com has exclusively learned. Late last night, Arvinda DeLeon Vasco, CEO of TopTopi Productions, confirmed final negotiations were under way for what is believed to be the first ever global TV reality series, centred around a chance for a complete newcomer to enter into Indian commercial cinema, known the world over as Bollywood. “I cannot confirm who are we in talks with,” he told www.asianculturevulture.com after several calls through intermediaries following a tip-off from a well-placed British TV source. He said the news would soon go around the world – a promo video was almost ready and he was comfortable disclosing some details to the readers of acv. DeLeon Vasco confirmed the series will select 25 contestants from five continents and pit them against each other for the coveted title of Bollywood global superstar in the making with a guaranteed part in a big Bollywood film. “We’re hoping to find one man and one woman. This is going to be a major, major global TV reality series. “One version will be in English and another in Hindi. He declined to name the broadcaster but said recent developments in content delivery meant a TV reality series like this could capture a global imagination – in real time too. He said the success of Amy Jackson (pictured above right), the Liverpudlian who has conquered South Indian cinema and Bollywood and now has a part in the US series, ‘Supergirl’, had spurred TopTopi to explore the idea seriously. 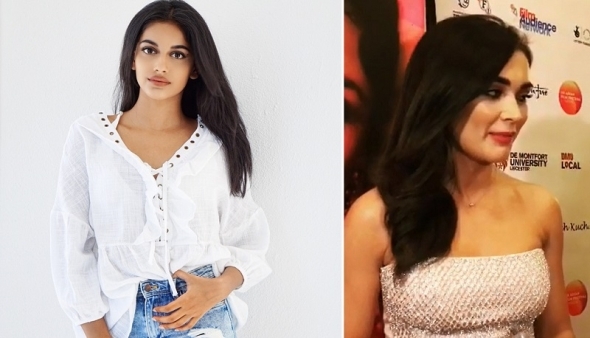 “It’s not just Amy Jackson, but there’s a new British actress called Banita Sandhu (pictured above left) who will be in a new film alongside Varun Dhawan who is one of the biggest stars right now in Bollywood. And we know loads of Britishers come here to try their hand. “We talked to a quite a few select people about the basic concept and right from the get-go everyone loved the idea and was totally into it. “We knew we were onto something and then a few months into discussions, we met a multi-millionaire in India with strong links to Indian broadcasting who said he was happy to invest in the concept and explore the idea – it’s really paid off now as we move into the final negotiations. DeLeon Vasco said there would no auditions in India itself. “We want to find people from outside India, people who may not speak Hindi much or even at all. He said the audition process is likely to start in the autumn with at least one talent search in selected cities. “There will be one in London, sure,” he assured www.asianculturevulture.com. “We’re looking at Paris for another audition but Europe in all will have only five people go through to the actual programme and competition – same as North America – which is likely to have one audition in New York and one in Atlanta and one in Toronto. “In Asia, it will be Hong Kong – we may consider some travel bursaries for Asian contestants. He explained ‘Search for a Global Bollywood Superstar’ will be a 10-episode series with the final in Mumbai and quite possibly broadcast live. He said the show itself will be shot in different locations in India and each episode will see at least two or more candidates eliminated. He told acv programme-makers were working through the logistics and the precise schedule with a very grand finale in the planning – with some guest star appearances too. “We’re about 18 months away from all that and we’re still working on the details – we aim to broadcast the final for roundabout Diwali 2019. “We have a commitment from a Bollywood filmmaker. That was crucial. No, sorry, at this stage we cannot reveal who that is; we understand the film has finance in place and a commitment from a couple of Bollywood stars too. “I think it will blow the contestants’ minds, but they have to remain focussed to win,” he stated. He said participants would need to show their dancing, singing and acting ability. “This is not some gimmick. We have some real Bollywood talents attached to this and we’re looking for people with that star quality.